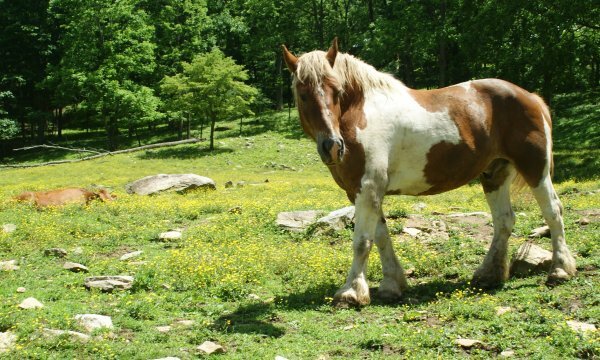 Here in our part of the Great Smoky Mountains a lot of the mountain folks still use draft horses, locally called “work horses”. You’ll see a farmer plowing his field or even cutting hay with his work horses, just like his ancestors did 200 years ago. And in some communities there are even restaurants with hitching posts where folks tie up their wagon while they eat. There are several wagon trains around here where as many as 50 wagons and their outriders get together for 3 or 4 days of driving through the countryside, camping out each night. Our big Belgian work horse, Mac, is what they call “ride and drive”—you can drive him and ride him too. Lately we mostly ride this gentle giant. Belgians are just a mid-size draft horse, not nearly as big as Clydesdales, but big enough—just one of his legs weighs as much as the average person!